Do any of you have a signature color? One to which you faithfully return even despite your best efforts? My friend Danielle does, I’ll let you guess what color it could be. A few weeks ago, Danielle accepted a great job offer after a long and frustrating hunt for the perfect position. I am really proud of her for landing the job for which she worked so doggedly. This clearly called for some celebratory knitting, and I had the perfect yarn on top of my stash: some leftover scraps from a project with Blue Sky Alpacas Worsted Hand Dyes in Petunia. I didn’t quite have enough yarn for full-sized mittens, but I knew I could eke out a nice pair of fingerless mittens with what I had (about 120 yards). 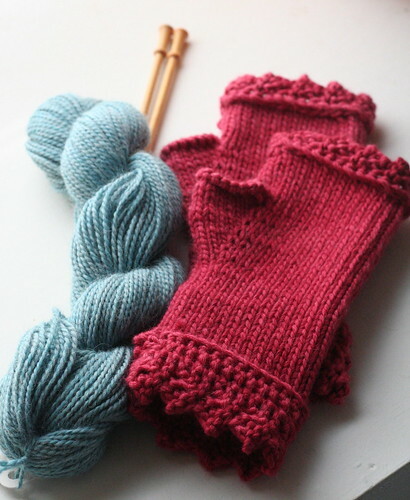 Dunbar’s Point Mittens are basic stockinette, fingerless mittens with simple lace edgings knitted on afterwards. 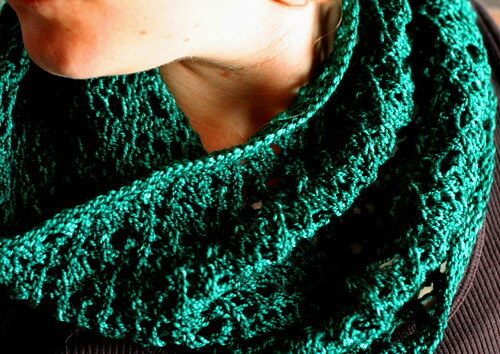 The pattern offers photo tutorials of a provisional lace cast-on and the knitted attachment of the edging. Dunbar’s Point provides the opportunity to learn and practice new techniques in a small, unintimidating setting. Both seamless and fairly easy, this is a perfect project for using up scraps too big to throw out and too little for much else. 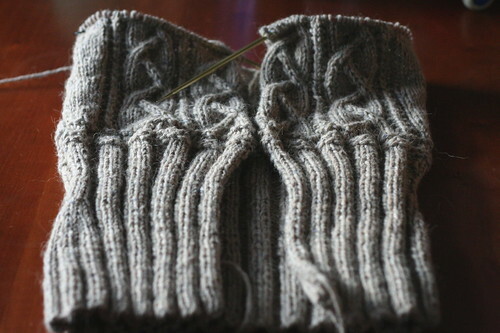 Plus, the knitting flies by rapidly – I knitted the pair in one evening, then attached the edgings the next evening. Although I considered using lace edgings on the thumb, I decided against it to give the thumbs need more freedom. After all, these should be useful, not just pretty. I hope these will serve Danielle well in her brand new office. At the very least, I feel fairly confident they will match whatever she’s wearing on any given day. Good luck on your first day, Danielle! Didn’t I tell you twist collective’s Fall 2010 issue would be amazing? If you have not yet seen the 30 beautiful patterns, I encourage you to check them out! I feel so honored that my latest design, Hallett’s Ledge, is included among them. 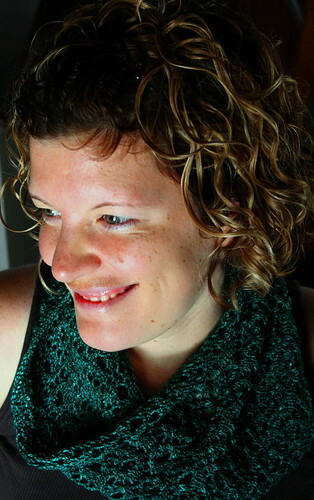 Allow me to share some of twist’s photos, taken by the talented Jane Heller. 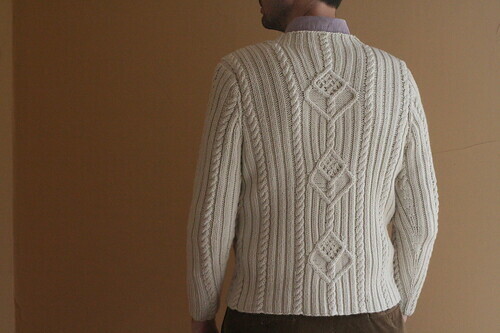 Hallett’s Ledge is a modern interpretation of a fisherman-style sweater. It takes its name from a shoal in Nantucket Sound, off the southern coast of Cape Cod. Knitted in Rowan Felted Tweed Aran, Hallett’s Ledge is a tailored and textured women’s cardigan that will prove both interesting to knit and easy to wear. The garment employs ribbing below the empire waist, garter eyelet rows marking the empire waist and echoed at the elbow, and an interesting cable pattern at the bust, upper back, and upper arms. It is intended to be worn with about 2″ of positive ease at the bust. The body is worked in one piece from the bottom to the armholes, after which point the fronts and back are treated separately. The close fitting sleeves are knitted in the round to the armhole, and then the sleeve cap is worked flat and sewn into the body. 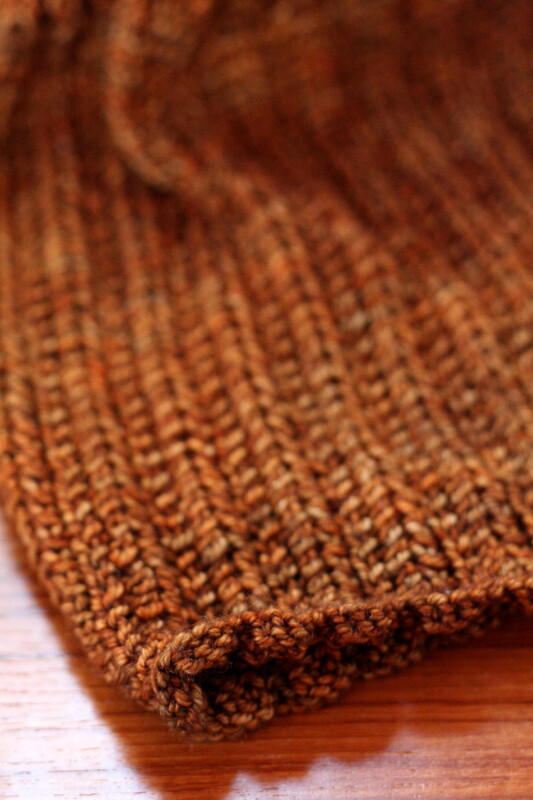 The neck band and button bands are picked up and knitted onto the body. This was another project I swatched last fall, hoping to create a modern, flattering interpretation of an aran sweater for women. As you may know, it is my firmly held opinion that heavily cabled garments should be trim fitting, with as little excess fabric as possible, due to the weight and bulk of the cabled stitch pattern. After all, there is nothing worse than a heavy, droopy, bag-shaped, boxy sweater. Nothing! I received my yarn only days after learning we would be moving 800 miles away in less than a month’s time. Consequently, I did all of my math and worked out pattern sizing before we left, and knitted the bulk of the garment on the road between Kansas and Ohio. Let me tell you, this was the most compelling sight along the interminably dull trek! The sweater itself knitted up quite quickly, although blocking took forever (DAYS!) because our washing machine had not yet been delivered to our new house. Who blocks the old-fashioned way? The spin cycle reduces drying time a hundred fold! 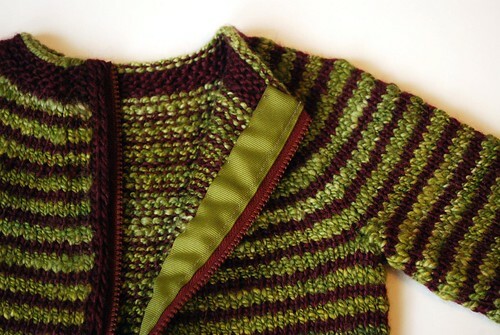 Of course, as with any ribbed garment, blocking is key. Look at the difference between the shriveled up in-progress body and the neatly blocked one. 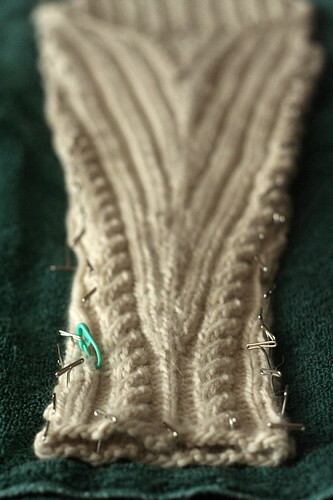 Because the ribbing shrunk up so much on itself, I also aggressively pinned down the button bands. The design element I love most about the garment is the centered cable running down the top of the sleeve. 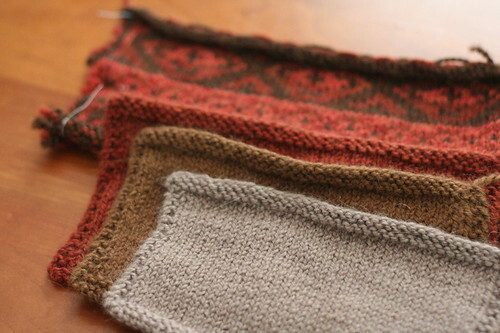 I love the symmetrical look of centered sleeve cables; consequently, I use them frequently. 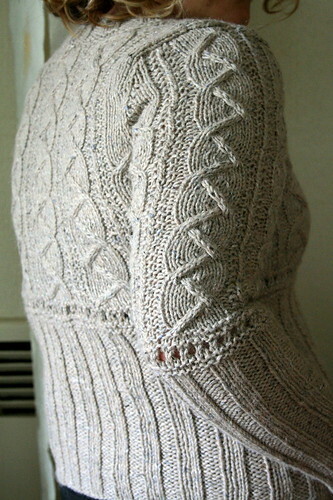 As with the sleeves, the cabling on the upper back is also centered. This requires a bit more math to set up the stitch pattern, but I feel it’s math worth doing. After all, I did not suffer through 7th grade algebra for nothing! Why didn’t anyone ever tell me algebra could be so handy? Although I intended 2″ of positive ease at the bust for this cardigan, I had to try on my sample despite it being a size too small for me! As you can see, this is a much closer fit (roughly 1″ of negative ease at the bust) on me. I do think the drape is better with positive ease, although your mileage may vary. 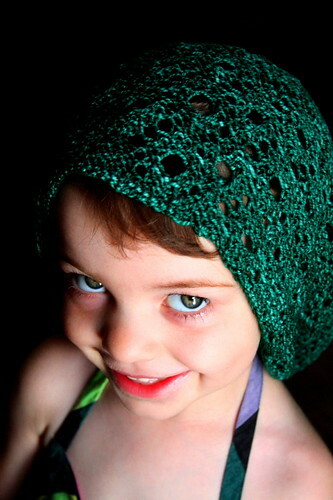 For more information about the pattern itself or to purchase a copy, please see the pattern page at twist collective. I hope you enjoy it! 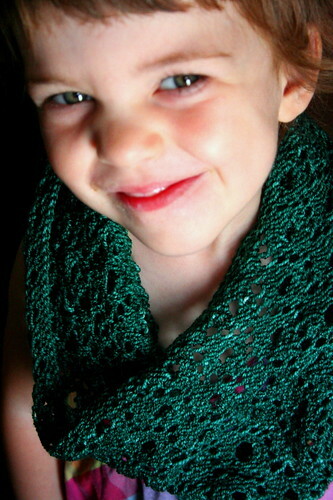 Please be sure to check out all the other lovely patterns, articles, and photos in the Fall 2010 issue. There are stunning works from many of my favorite designers in this issue! Hello, there. 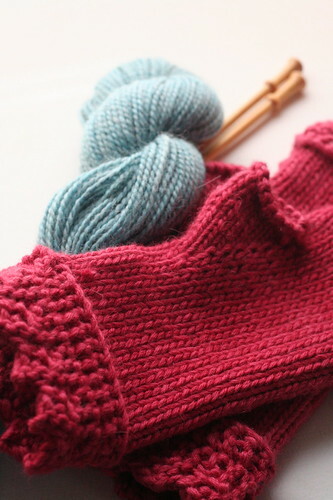 Do you know you’re reading a knitting blog during the dog days of summer? What are you thinking??? If you are like me, you’re looking for some quick and easy projects to carry you through the remains of the summer before wool for fall sweaters lands with a thud on your doorstep. * I’d like to introduce two quick cowls to you, both made with lovely yarns, the first available in my pattern shop, and the second in the Fall 2010 issue of Knitscene. Perhaps they will do the trick. I hope you enjoy them! 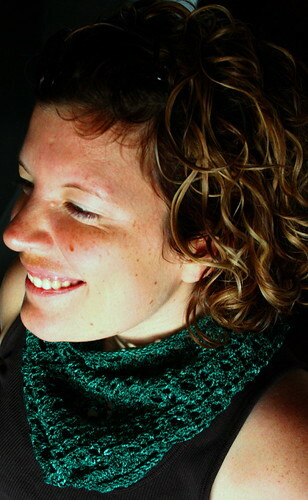 Mill Creek Cowl is a simple lace cowl worked up with a 10-stitch lace repeat over 12 rounds. After ripping back once for not following my own instructions (it happens, I have trouble following directions), this knitted up quickly in a day or two. I used Neighborhood Fiber Co. Studio Sock, a 100% merino sock yarn that comes in delightful semi-solid shades. This is knitted in Sheridan Circle, which was a blue-green I just could not pass up. I cannot tell you how much I love it! This is an excellent stashbusting project, for those of you with a spare 250 yards of sock yarn kicking around. What? No one has lonely sock yarns? Hmf! I don’t believe you. Like most nice lace stitch patterns, this looks as good on the wrong side as it does on the right side, I think. Beatrix definitely prefers the wrong side. She likes to be contrary. 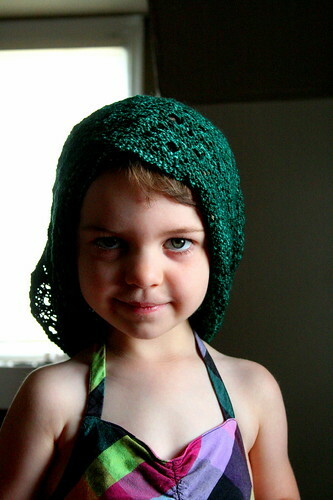 She also likes the cowl-as-snood look. The second cowl, Northumbria Cowl, appears in Knitscene, Fall 2010 magazine. 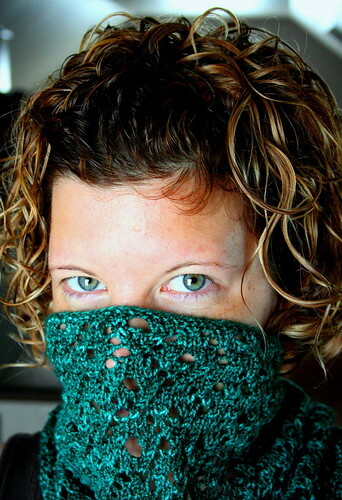 The ribbed lace pattern is simple – very simple – but makes for a nice mindless project in an absolutely delightful yarn, madelinetosh pashmina. Pashmina, a blend of 75% superwash merino wool, 15% silk, and 10% cashmere, produces a lovely knitted fabric; however, it is the dye that truly makes the yarn. I felt relieved that my cowl pattern was so simple, as I think a more complex stitch pattern would both be lost in and detract from the beautiful shading of the yarn. This is shown in Ginger, a color that positively announces autumn! Track down some Pashmina for yourself, you will not regret it. Finally, if you really are thinking about knitting at the peak of summer, be sure to check out my new sweater, Hallett’s Ledge, in the Fall 2010 issue of twist collective, which launches tomorrow! I cannot wait to see the whole issue! Judging from the list of contributors, I just know it will be a great one. * Yes, I do patronize my LYSes, but the yarn I look forward to this fall is coming by truck, for better or worse. Last winter, back when I was really pregnant, hopped up on hormones, and a little bit crazy, I sketched out 483902734890294023573489573489 ideas for future knitting patterns. Next, I proceeded to do something a woman preparing for many sleepless months with a newborn and a likely move thereafter should not have considered: I submitted several full-sized sweater ideas along with a battery of stranded mittens and hats. I don’t know what I was thinking, but fortunately (and, quite miraculously), everything worked out well. Point Gammon Pullover, published in Interweave Knits, Fall 2010, is the first in a series of works that will appear in the coming months, the result of my knitting in the middle of the night with a new baby, en route to medical school interviews, and while laid up after tearing my calf muscle playing soccer. I knitted like a fiend this winter and spring, and I cannot wait to share my projects with you! 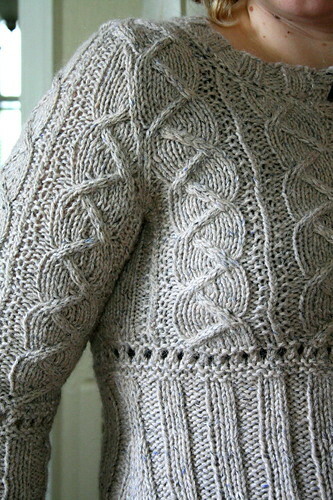 This follows in a series of cabled knits inspired and named for the waters I sailed on Cape Cod, Massachusetts as a child. Point Gammon is a somewhat obscure lighthouse marking the outcrop of Great Island into Nantucket Sound; it is a point reachable only by sea, as the land upon which it sits is private. Growing up on Lewis Bay, the bay whose entrance the lighthouse announces, Point Gammon Light seemed at once both intimately familiar and utterly foreign to me. I always admired the peculiar structure, wished I could see it up close, and wondered what the view must have been like from the other side of the bay, the private, off-limits side. 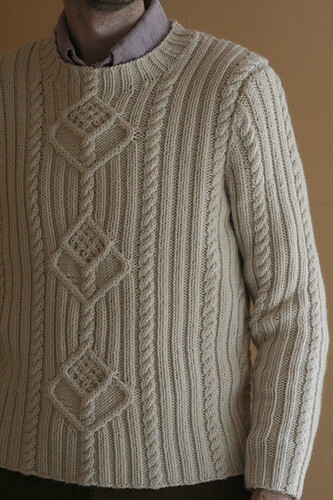 I designed this pullover with the lighthouse in mind, intending the central cables to evoke a lighthouse beacon. In keeping with the ocean theme, I placed netting cables up the sides. 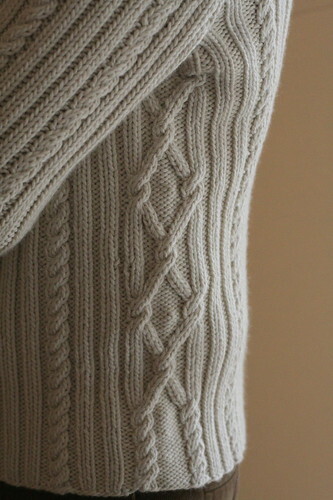 In my opinion, both cables that extend from bottom hem to neckband and cabling at the underarm in place of a seam signal a well planned, hand knitted garment. Any machine can churn out a cabled something or other, sew it up the sides, and slap on disjointed bands. Cabling done well should be difficult to recreate in a factory. The fit is trim (i.e., 2″ of positive ease, if I recall correctly); both the ribbing and the set-in sleeves emphasize this. As I have said before, despite the traditional form, you will not find any drop shoulders around these parts, thank you very much. 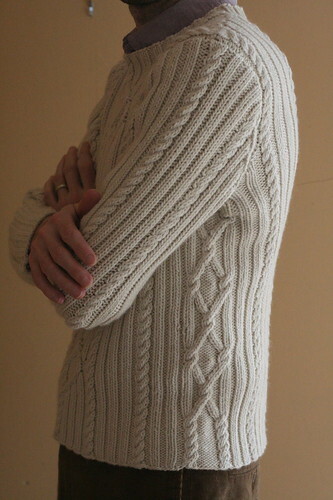 The sleeves are little more than basic rib sleeves with cables interspersed at the same intervals as on the body, with one cable running down the center of the sleeve. I love symmetry, I can’t help it. 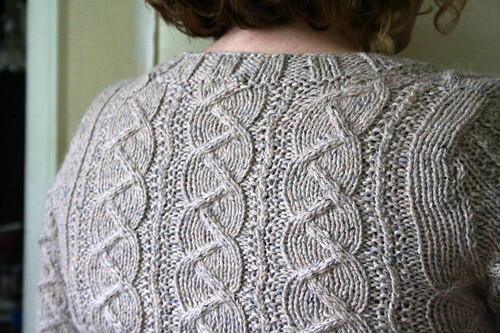 While it may appear difficult to work out how to run the cables into the neckline like this, it is not very hard. 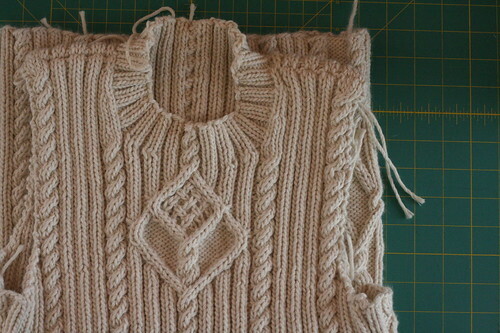 Once I determined how many repeats of the cable pattern I wanted down the front, I centered the repeated section, then held stitches at the base of the neck instead of binding off and picking up for the neckline. One benefit of a side cable is that it can be completely bound off at the underarm, so there is nothing left to keep track of. And, it looks complicated while completely avoiding the question of how to treat the seam. Although it makes shaping more difficult, one could certainly work decreases along the flanks of the side cable. I briefly contemplated making a shaped version for me, but you know I never knit anything twice unless I have to, right? Of course. 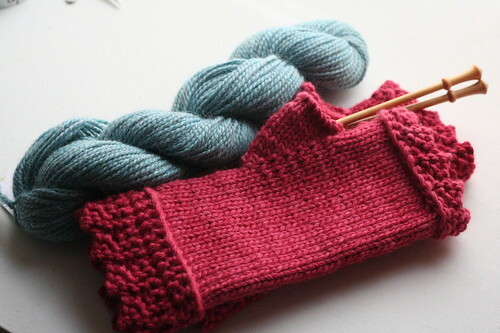 Because Blue Sky Alpacas Worsted Hand Dyes was unfamiliar to me at first, I knitted a positively gigantic swatch. I do not feel terribly confident about my gauge with refined, luxury fibers, as the fabrics knitted in those fibers often grow. I swatched, I measured, I washed, I measured, I blocked, I measured. 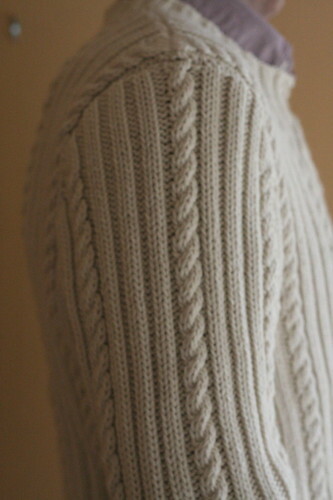 Anticipating this post, I thought I would show a picture of the pre-blocked body (missing sleeves, of course). It was so tiny, despite needing to fit a man (albeit not a large man). 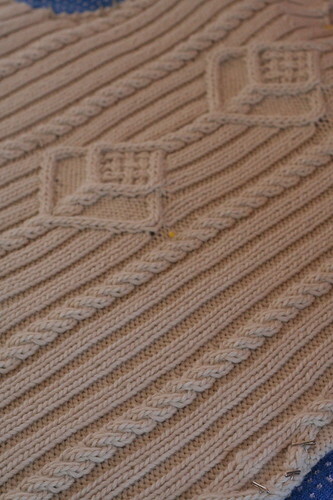 Before washing and blocking, it had a 30″ chest. After blocking, the chest measured 36.75″. Be wise: swatch aggressively and believe in your swatch, do not second guess yourself! 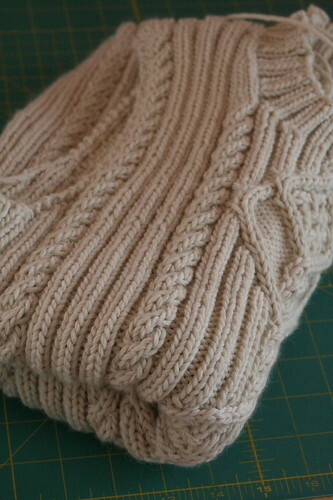 I thought I would include a photo of the underside of the sleeve blocking. 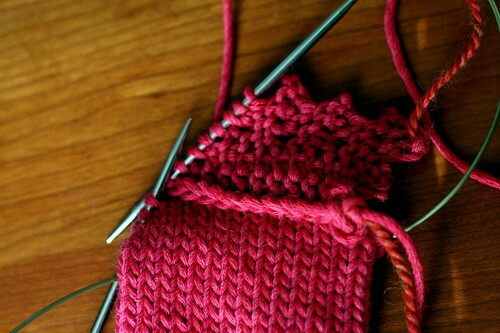 Is there a secret to getting ribbed increases to block to straight lines? I can never make mine perfect! Let us take a minute to discuss the yarn, shall we? Blue Sky Alpacas Worsted Hand Dyes might be the nicest yarn I have ever – or will ever – work with. Once I finished the garment, I had to try it on, even though there was no way it would fit me well. I have told anyone who will listen that wearing a sweater made in this yarn feels like wearing a hug. I have one sweater’s worth of it in my stash, which I am saving for The Best Sweater in the History of Time; the yarn really deserves the perfect pattern. 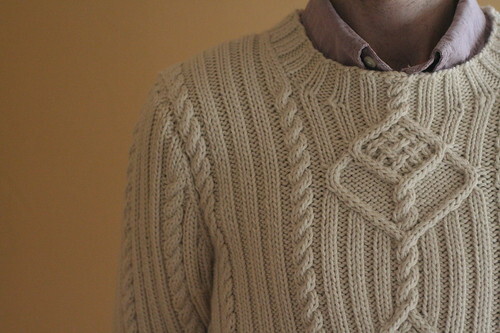 Initially, I worried it would be too heavy for a men’s cabled pullover, as its yds per gram ratio is only 1. For other worsted weight yarn comparisons: Cascade 220 has 2.2 yds/gram; Berroco Blackstone Tweed 2.6 yds/gram; Harrisville Designs New England Highland has 1.9 yds/gram. Thus, for the same yardage as another worsted weight sweater, Worsted Hand Dyes yields a garment that is twice as heavy. Indeed, the finished product is heavier, but it’s one of the things I loved most about the fit. There’s a sentence I never expected to write, but it is absolutely true. I think its weight combined with its softness make you feel as if you just wrapped yourself in the most lovely cocoon that could possibly exist. It’s expensive – very expensive – but as the cheapest knitter you will ever meet, I say it’s worth it if the pattern is perfect for you. On that note, I hope some men out there find this pattern perfect for them! As for the rest of you, go check out the rest of Interweave Knits Fall 2010 (or see it on Ravelry) – it is the best issue in ages! I could make full-time work of knitting all the sweaters I want to make in this one issue alone! Nothing gets me more panicked about knitting for my kids than July and August. The school year approaches, you know! What’s that? You say my kids aren’t in school yet? Hm, yes, well there is that. However, as many of you know, I will begin medical school in less than a month, so at least one of us has to prepare for the school year. As you might expect, I feel a bit panicked about losing my knitting time; naturally, I’m spending my last month of freedom planning lots and lots of projects! 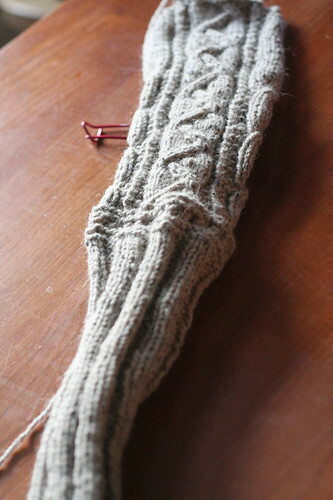 * I must remind myself that because I knit while I study, August 2010 does not mark the end of my knitting days. Whatever you do, please do not leave a comment asking how I will ever knit again, OK? Thanks. Despite my impending lack of time, I have been planning what I will make for my kids this year. I thought I would share my ideas with you. 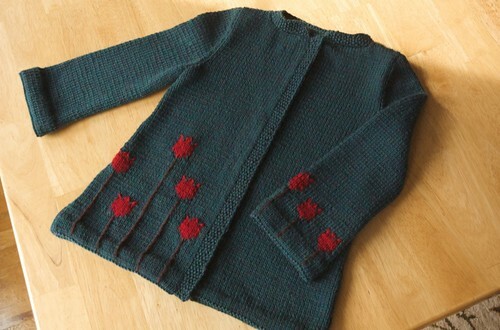 For Beatrix, I would like to cast on for a Morgan’s Flower Garden by Amy Herzog. Everything is red with Beatrix these days, so I will probably have to change the main color to appease her. 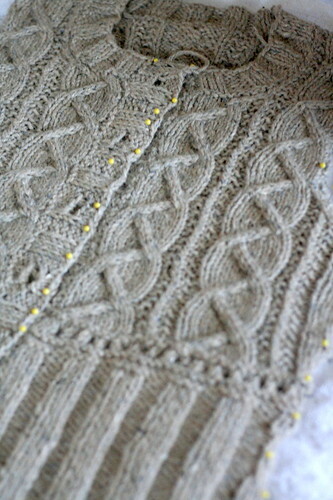 Although the pattern calls for Cascade 220, I intend to use some Berroco Ultra Alpaca bits floating about in my stash. With shrinking knitting time, I need to make sure what I knit for the kids is both cute and functional; this definitely fits the bill. 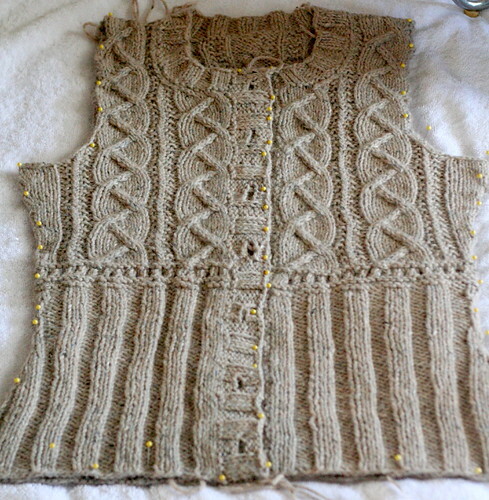 For Odysseus, I hope to make an Ella Funt by Pamela Wynne before Chubby outgrows the pattern sizes. Perhaps I should get started on this first, since my tubby seven-month-old is already 22 lbs. He wears things for a week before outgrowing them. The pattern calls for sport-weight yarn, and boy, do I have sport-weight scraps! In fact, my stash seems to be comprised almost exclusively of them. I am somewhat embarrassed to admit I have only made one sweater for little O in his life and I made it before he was born. That is to say, of course, it doesn’t count. The little man needs some woolens for the winter when his mama is away in the anatomy lab, don’t you think? Finally, I’m planning grumperina’s Budgie Striped Sweater for sometime this fall/winter. Isn’t it adorable? True, I am a sucker for anything striped, but the zipper is what makes it a very useful, day-to-day garment. Once they start teething, little babies tug every button in sight to get it into their little mouths, which is dangerous for them and disastrous for their sweaters. 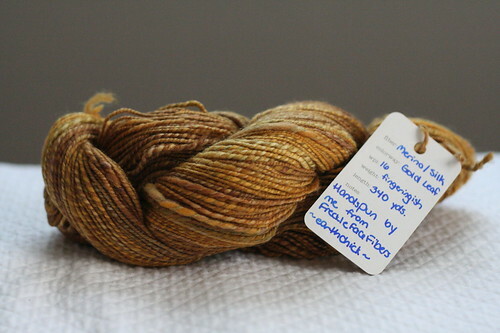 Stacey recently sent me some of her own handspun, and it is burning a hole in my stash. 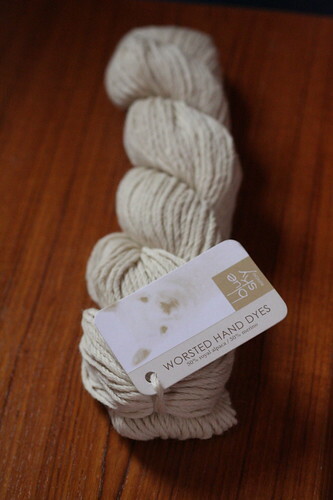 I have never used handspun, and this stuff is gorgeous. I only worry about selecting the wrong project and wasting it! 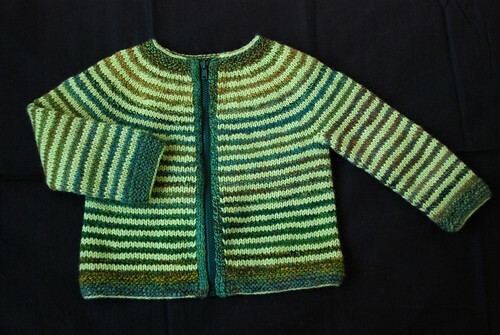 It would look great with this pattern, but a baby sweater might be a waste of handspun, don’t you think? Like grumperina, so many of my friends and relations are expecting babies right now. 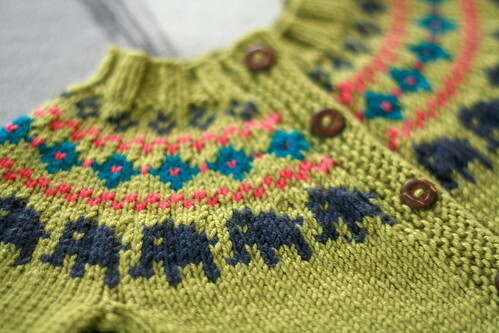 I feel like my list of baby standard sweaters has dwindled to a few about which I’m not terribly excited. It’s time to shake things up a bit and find some new go-to baby knits. I think both Ella Funt and Budgie will fill the void. 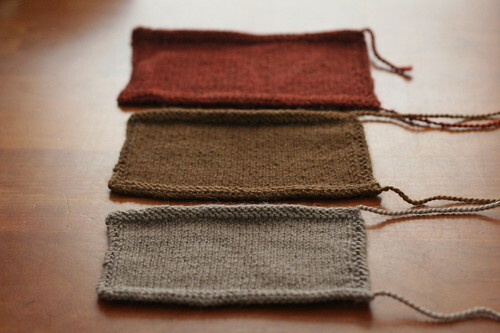 I’ve also been swatching a little bit on my own for some baby items, playing around with gauge and color values, but I have not yet found anything I must knit. 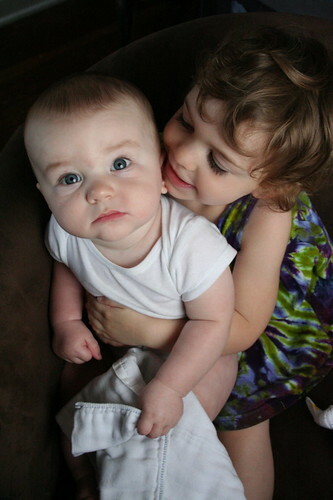 What baby and kid patterns excite you?